About Ann: I am a retired secondary education school teacher, an aunt, a sister and a friend. I am the mother to 3 four-legged children - two girls (bassett hound mix) and one boy (maltese mix.) 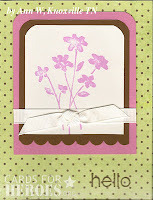 I enjoy collecting my "stash" of scrapbooking and card making supplies as much as I do using them. Actually I think from the size of the stash - I collect more than I use. But I am afraid the saying she who dies with the most stash wins - and I wanna win. It IS an addiction :) I enjoy anything involving my alma mater the University of Tennessee - especially watching sports of all kinds - as long as the my beloved Volunteers are involved, I love it!!!! Also I love spending time with family and friends, eating out, playing on the computer, watching TV and music of all genres but especially the music from the '60's. How long have you been making cards? I have been making cards for over 6 years. Plus I started scrapbooking back when scrapbooking wasn't cool. I still have some very old albums that were on the old-timey kraft paper back from my high school days over 40 years ago. How did you hear about Cards for Heroes, and how long have you been making cards for the organization? 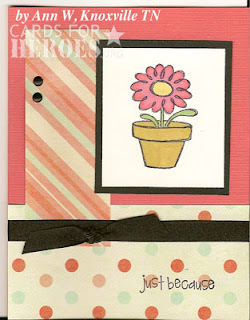 I heard about Cards for Heroes on the Two Peas in a Bucket website. I lurked on the message board reading all the great posts for months before I decided to join in the fun. I have been making cards for about 2 years for the troops. What is your favorite kind of card to make? It is easier to answer what is my least favorite to make because all the others are about the same. I find masculine cardsto be more of achallenge to create than other types of cards. Most of the cards I make, I leave blank on the inside so the troops can write a longer message. Do you have a special technique you like to use? I don't think I have any special techniques that I like to use. It really all depends on my creative mojo and mood. 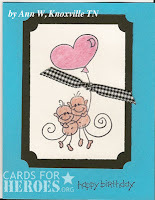 I belong to a Stampin Up group through one of the local churches. Many times I use what I learned at the last month's meeting. Are there colors, style, or a product that "draws" you? 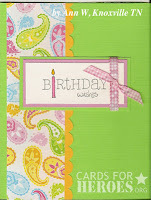 I love to use patterned paper and ribbon. I found wrapping paper can be an inexpensive substitute for patterned paper. For example I found some zoo theme wrapping paper that made some really cute kids birthday cards. 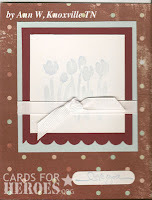 Since these are cards and not scrapbooking pages, I didn't worry about the acid free situation. 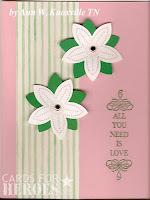 In regard to stamping, I use mostly Stampin Up product. How often do you make cards? I make more cards during the winter time than any other time of the year. Call me a person with seasonal attention deficit ... but during those months I tend to stay inside and get bored easily - so card making fills the bill. I find it all very therapeutic. I truly take making cards or doing anything for that matter by "spells." What motivates you to make cards for our heroes? First and foremost, I love my country. This is a one way I can support those who are protecting this wonderful nation at home and abroad. Secondly, my step-dad served in the Korean war. My uncle was stationed in Germany during the Berlin crisis. I can remember getting postcards and letters from him and reading in amazement and knowing he was a half world away. Recently I ran across some of his old pictures of the Ramstein airbase where he was deployed. I think Ramstein is used to airlift seriously injured out ofIraq as point for additional medical treatment. (But I could be wrong? )Also I lost a high school sweetheart in the Vietnam war.I suppose I have a huge patriotic heart that bleeds red, white, and blue. Making cards for the heroes and their families is just as small way for me to repay them for their service. I wish I could do more!!!! Finally, God blessed me with acertain degree of creativity. By making cards, I feel I am honoring the talent He gave me. Praise be to Him! And may He continue to bless our troops, their families and all those involved with cards for heroes program.